Synonyms Vanilla beans; Vanilla pods; Fructus vanillae; Baunillha. Biological Sources Vanilla consists of the cured, full grown, unripe fruit of Vanilla planifolia Andrews, commonly known as Bourbon, Madagascar or Mexican vanilla; or Vanilla tahitensis J.W. Moore, frequently termed as Tahiti vanilla, belonging to family Orchidaceae. Geographical Sources The plant is indigenous to the Eastern coast of Mexico. Presently, it is widely cultivated in West Indies, Reunion, Mauritius, Seychelles, Tahiti, Java, Madagascar, Ceylon, France, Polynesia, Indonesia, Uganda, Hawaii and India. Preparation The full grown and unripe fruits are hand picked at that particular stage when their colour changes from green to yellow. These fruits are allowed to undergo fermentation whereby a characteristic flavour and aroma develops gradually. However, the very important and critical process of fermentation essentially consists of slow drying in shades at a controlled temperature. 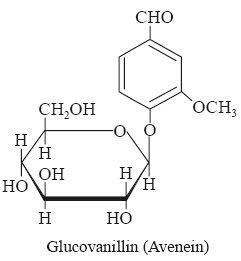 Fermentation, in fact, helps in the conversion of vanilloside to vanillin and glucose respectively. Taste : Acrid and astringent. It also contains another glycoside known as glucovanilline alcohol, which upon hydrolysis yields vanillic alcohol and glucose. The vanillic alcohol on oxidation gives vanillin. 1. It is mostly used as a pharmaceutical aid for flavouring various liquid preparations. 2. Interestingly, the pleasant odour and flavour of vanilla are not only confined to vanillin, but more or less collectively on account of vanillin along with other fragrant chemical constituents. 3. Vanillin enhances the chocholate flcvour of cocoa based malted milk foods.